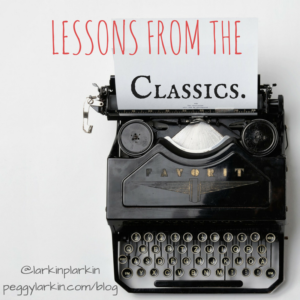 Note: This is part of an ongoing series of posts that take what I’m teaching in my 11th-grade American Lit classes and then shows how that could translate into creative writing, using examples of what I’m doing. I welcome feedback, because I’m no expert on American literature–just somebody who’s been teaching it for a couple of years. I would also love to hear how other writers are using these tools! This week in American lit, students are working in small groups to read Bret Harte’s* short story “The Outcasts of Poker Flat” (1892). This is our first example of literary naturalism, or a story that presents as its theme a bleak worldview in which individuals are crushed and destroyed by an unfeeling world/social order (or, as I tell the students, “if everybody’s dead at the end and nobody cares and nothing changes about the world, it’s probably naturalism”). The plot of “Outcasts” finds four ne’er-do-wells from the town of Poker Flat escorted out of town: John Oakhurst, gambler; Mother Shipton, who runs a brothel; The Duchess, an employee of Mother Shipton’s; and Uncle Billy, a drunk and a suspected thief. This being naturalism, they all end up dead in the wilderness, but Harte’s focus on their actions between their expulsion from civilized society reveals that “in the end…these seeming derelicts really had hearts of gold” (VanSpanckeren 5). Well… most of them, anyway–Uncle Billy definitely takes the mule and horse and leaves the rest of them to die. The story ends with Oakhurst writing his own epitaph on a playing card (“who struck a streak of bad luck…and handed in his checks”) and nailing it to a tree–“And pulseless and cold, with a Derringer by his side and a bullet in his heart, though still calm as in life, beneath the snow lay he who was at once the strongest and yet the weakest of the outcasts of Poker Flat” (Harte 35). As I made several students explain to me, Oakhurst is physically strong, and stays calm, and cares for others–the strongest–but gives up and kills himself–the weakest. That juxtaposition–the innocent and the sinner, the strongest and the weakest–is, to my mind, what gives this story its punch; and let’s not pretend we don’t all love a noble thief or a charming rogue, right? The “rebels taking down an empire” thing may also have some promise. 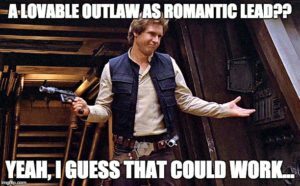 One of my WIPs features a romantic-hero-mafioso, and the other a band of rebels desperate to bring down an empire. These things have, like everything, been done before, but I think I can get some good hints from Harte about how to use juxtaposition to create interesting characters, and to do it using indirect characterization. Note: This is the first in an ongoing series (I hope?) of posts that take what I’m teaching in my 11th-grade American Lit classes and then shows how that could translate into creative writing, using examples of what I’m doing. I welcome feedback, because I’m no expert on American literature–just somebody who’s been teaching it for a couple of years. I would also love to hear how other writers are using these tools! This week in American Lit, we’ve been talking about dialect (writing that imitates the way people actually speak, including accents, slang, and idiom) and how writers use that to provide indirect characterization. The story we read is Mark Twain’s “The Celebrated Jumping Frog of Calaveras County,” a short, humorous exploration of the type of characters populating a rural mining camp in the 1860s. It’s also a frame story, with an unnamed narrator introducing and closing out the tale in deliberately prolix style, the better to heighten the contrast with the main tale, told by “good-natured, garrulous old Simon Wheeler” (Twain 1). The version at the link has a different ending than the version in our textbook, but the same general ideas are at play in both. Simon Wheeler: feller, flume, curiousest, so’s, solit’ry, dangdest, thish-yer–and I was very unsuccessful in convincing them that “Well, blame my cats!” should make a comeback in teen vernacular. There’s clearly a vast gulf here in terms of diction (syntactically, they both tend to run on, but only one of them does it grammatically). It would be very, very easy to label any sentence from this story as spoken by the Narrator or by Simon Wheeler, based on diction alone, because their dialects are so distinct.